Microwave ovens are often on the countertop. 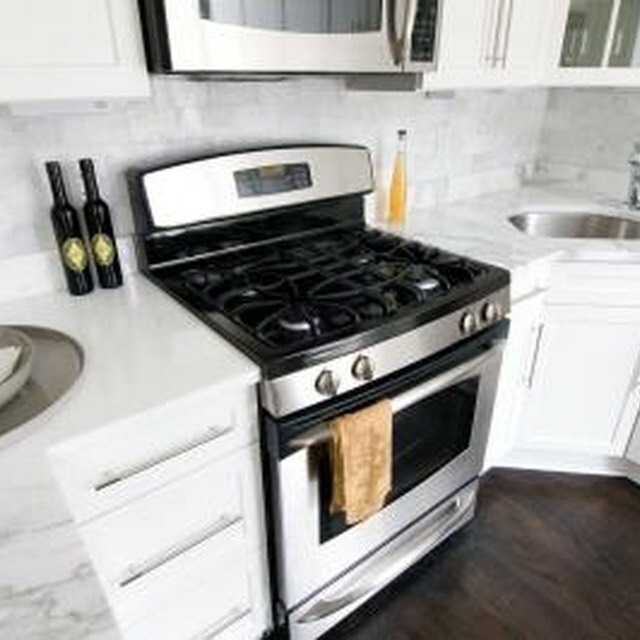 If you have limited space, or are redesigning the kitchen, you may wish to consider installing it over the oven range, which frees up valuable counter space. Installing an over-the-range microwave requires a good attention to detail. Hung improperly, the oven may fall causing damage to the oven and countertop beneath as well as possible injury. Always reference the owner's manual included in your oven for product specifics. Over- the-range microwave ovens have specific installation instructions. Turn the oven on its side. Release the mounting plate from the bottom of the unit. Locate wall studs in your installation location using a studfinder. Draw a line down the center of the studs. Screw the hood of the microwave oven into the wall above the mounting plate location. Screw the mounting plates into the stud location with the mounting plate top touching the underside of the cabinet. Use toggle bolts for mounting the oven. Align the wall plate between the two mounting plates, centering the center line notches of the plate in the middle of your hanging area. Hold a spirit level against the plate to ensure it is straight. Drill a hole into the bottom of the cabinet above for the power cord of the microwave oven. Lift the oven into place, placing the bottom portion of the oven into the mounting bracket until the grooves on the back of the oven catch on the mounting bracket. Insert the self-aligning screws through the bottom of the hood above the oven into the oven. Turn the middle screw two full turns to lock it in place while you are tightening down the other screws. Always mount the microwave oven on a flat, vertical wall. Do not mount it in a slanting location. Use the installation instructions included with your unit if the oven requires a vent. Vents are product specific. Improper installation may cause excessive heat, fire and damage to your kitchen. Place the spirit level on the underside of the cabinet above your oven and make sure it is level. Adjust the mounting plate locations accordingly. The oven must be level for proper operation.